The minor cocaine addiction signs are found on the body and are visible. They include a bleeding nose, wet and runny nose more frequently than average, colder and more pale skin, dilated pupils, and broken blood vessels in the eyes followed by some on the skin. More subtle cocaine addiction signs are a decrease in smell, taste, touch, and general sensation throughout the body. The body has a harder time regulating its temperature with the increased intake of cocaine, even hours after use. The steady use and addiction to cocaine causes severe spikes in the bodies functions which stresses the physical health of the abuser over time. The highs of the addiction become diminished with each use and higher levels of cocaine must be administered to receive the same high. With the increase of dosages, the signs will become clearer and sharper. Increasing intervals is when an addiction can be either health destroying or lethal. With increased intake and higher doses, a person with an addiction to cocaine will constantly be displaying signs of the addiction. With the requirement of steadily pushing the levels of a toxic drug up higher and higher the body begins to be overloaded by the physical spikes of highs. The degeneration first leads to noticeable physical, mental, and emotional signs. Soon the heart and organs are stressed beyond repair from the addiction to cocaine. The immune system and hormone levels are soon to follow. The diminishing of the hormones slows the bodies repairs and decreases its ability to rid the body of waste. 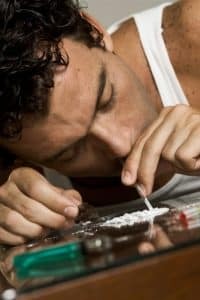 The drop of the immune system leaves the body very vulnerable to anything such as bacteria, infections, or viruses it encounters on a daily basis A severe addiction to cocaine will lead to, immune suppression, organ damage, respiratory damage, diminished hormones, increased acid waste, and in many cases irreparable damage. An addiction to cocaine because of the drugs’ nature and heavy physically addictive qualities will most certainly lead to a heavy dependence. With all the severe consequences, the drug takes on the inside; the signs are easily seen from the outside. Cocaine addiction signs will be constantly getting sick, allergic reactions, trouble breathing, broken blood vessels, pale skin, blood shot eyes, and erratic behavior. The easy to spot cocaine addiction signs are the emotional and nervous system signs. The common emotional cocaine addiction signs include severe depression following the high of the drug. An inability to find anything good about life because they do not have the high. Cocaine users are very irritable oftentimes without the high. High levels of anxiety and restlessness are clear signs of possible drug use. If some of the signs above are shown and followed by paranoia, then assume a drug addiction. Paranoia will show clearly because soon the person cannot act normally. The person will obsess, shake, sweat, emotionally break down quickly, demand, request, and show extreme impatience and insensitivity. The signs become more and more clear as time goes on.